In this fast paced world, we expect to get everything within our finger tips. And the technology had contributed so much that the things you wish could be achieved within seconds or minutes. Well, that certainly had made things easier but the abyss of laziness cannot be ignored that comes as the burden with it. There were lots of things we were putting in the back burner for a while. As a New year resolution, I started to put them together as a check list and have it next to our coffee table area. It's helping me a lot to get the things done than I thought and I take them off the list when the task is accomplished. As we find more things, we update the list and the process continues. This might sound silly, but making a note of things that needs to be done gives me the pressure to get it done, otherwise the lazy minion in me wakes up. Working out is another task in the list, that has taken a break for a while and I cannot procrastinate anymore. Getting back to the routine of working out is the hard part for me, once started it goes smoothly at least for some time. Lack of inspiration is what I blame on for that. I am planning to blog about more savory dishes this year. Hope I can keep myself focused. 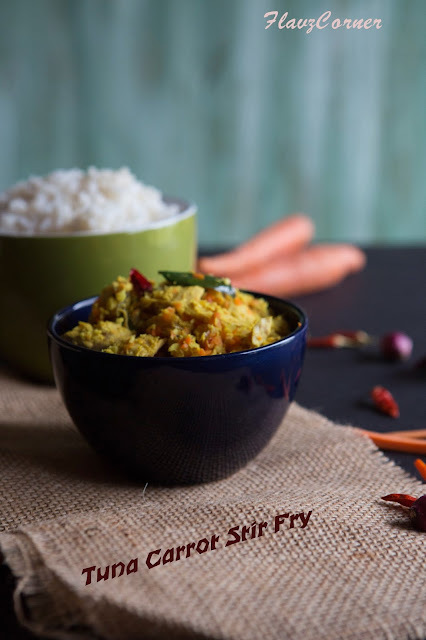 So to begin with I want to share this quick and easy stir fry that is a variation of the typical keralite stir fry made with spiced shredded coconut and sardines, small shrimps or with any small fish which is called 'Meen Peera Pattichathu'. It is prepared in earthen vessels called 'Chatti' and it tastes heavenly when accompanied with steaming plain par boiled red rice ('Kuthari' chooru) and spiced yogurt ('Mooru curry'). This recipe is from my mother-in-law and this was the only fish item I liked when I came to US as I was getting adapted to the tastes and flavors of Americanized Keralite food. I spiced up the recipe to fit according to my taste and this is a recipe I rely on for a quick and easy non-vegetarian stir fry with rice. If you have a mini chopper or food processor, this dish can be prepared within 15 - 20 minutes. Give this recipe a try and I am sure you will like it. 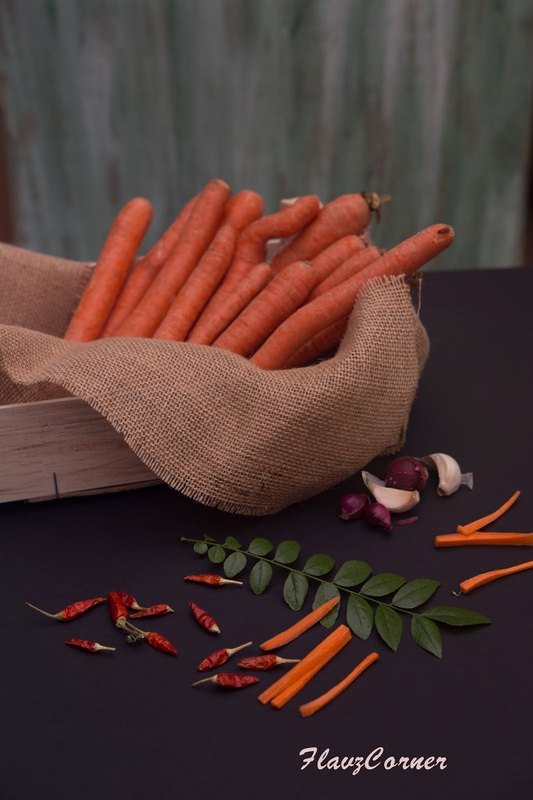 Since the main ingredients are all taken in equal measurements, nothing over powers the tastes of the other ingredient and it is easy to remember too. Wash 1 piece of Tamarind or Kodum Puli and soak in 1/4 cup warm water and keep it aside. In a wok or non-stick pan or a earthen vessel ('Chatti'), splutter 1/2 tsp of mustard seeds in 2 tsp of oil. If using whole red chili, add the dry red chili and roast for 30 seconds. Take the chili out and keep it aside. Add the chopped garlic, ginger, onions and salt and saute for 2 minutes on very low flame. 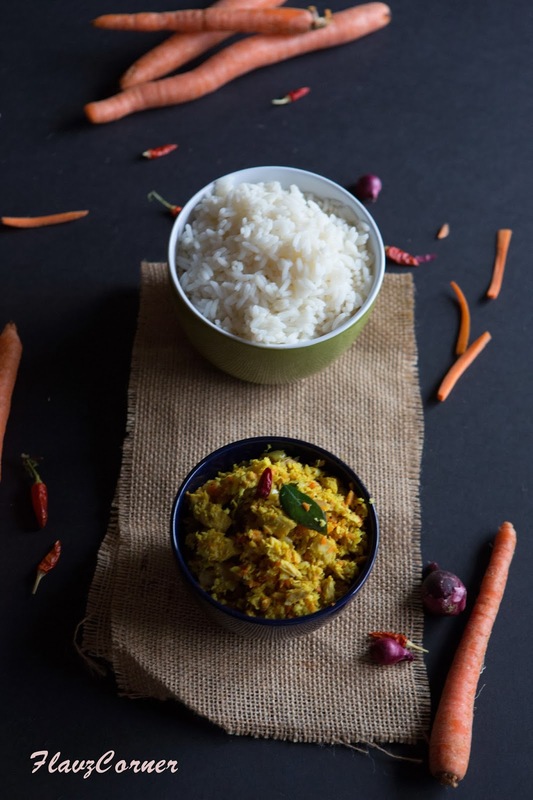 While the onion is sauteing, pulse the shredded coconut with 1/2 tsp of turmeric and roasted chili or 'Kanthari Mulaku' in chopper or food processor for 1 minute and keep it aside. Now add the drained tuna to the sauteed onion and cook for 2 minute or till the fishy smell fades little bit. Add the fenugreek powder and cook for another minute. Add the chopped carrots, pulsed coconut mix, tamarind piece with water and 1 sprig of curry leaves. Adjust the salt and cover and cook for 5 - 6 minutes on low flame or till the water is all dried up and the carrots are cooked. Fluff up the stir fry with a wooden spoon and garnish with remaining curry leaves. Serve the 'Meen Peera' with steaming plain rice and spiced yogurt ('Mooru' Curry). You can find Fish Tamarind in Indian Stores those carry South Indian groceries. They are black in color and are used in Keralite fish curries. If you don't find the tamarind, you can substitute it with 1/2 cup of chopped raw mango to make the dish tangy. If you are using the South Indian small chili ('Kanthari Mulaku') you don't have to roast the chili, you can directly pulse it with shredded coconut. Wonderful dish, love the spices, everything goes good together! Must try! I am glad you like my recipe for a sweet potato chips! aah..have never thought of this combination, Shibi. shud try, next time. Wow. This looks great. Never thought to stir-fry canned tuna before, but this looks incredibly flavorful! Really good stuff - thanks. Excellent Photography!! !Happy to follow you!!! Thinking of working out? really ? u look all thin and fit already. I absolutely don't find it silly, I think it is a nice way to keep track of things to do. All the best with everything, you go girl. This recipe looks so good. The carrot picture is stunning. Very healthy and creative recipe my friend. It sounds so good and love those pics.